Hiya! Here it is the first "just a tip" of 2014 and its my new favorite. Next time you roast potatoes, squash, a chicken, whatever you might roast - throw a few whole cloves of garlic on the pan. They'll roast too - getting all mild and sweet - and then you can save them for later use. Roasted garlic is delicious whipped into butter, smeared on garlic bread, but its also really love in a vinaigrette or in pesto. 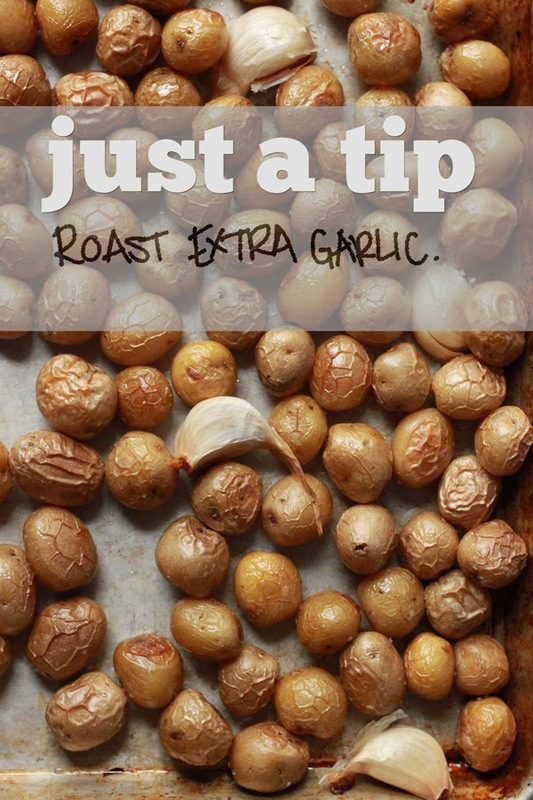 For all you mamas - roasting garlic makes it much more mellow - so you can add it to pasta and your toddler might still approve* and you'll enjoy the extra flavor. Great Tip!! and the whole toddler eating war (yes i called it a war) is a battle that I lose everyday.. Thanks! And what is the deal toddlers? They make no sense. Roasting the garlic totally helps with that, umm, pungent breath thing.